Do you ever wake up in the morning and crave something, not quite sure of what it is? You know, some type of anchor you can hang on to that will carry you and sustain you throughout the day? Many of us know that how we actively start our days have lasting effects on how our day will play out. That's why I like to make sure I do everything I possibly can to start my day out with encouragement and positive reinforcement. Because it's easy to slip into a funk if you let yourself. Yesterday's disappointments can creep up on you and stir in your mind longer than you want them to. Everything you didn't get a chance to finish up last week can fill you with more worry than you can handle in your early waking moments. And sometimes unexpected stresses and worries will have permeated your mind space before you can even get up and reach for that coffee. You're all in a funk before you even hit the shower and you are wondering how you even got there. So to combat any negative thoughts that may come my way, I try to armor myself with the Word as soon as I get up and think about it. Starting your morning off in prayer is a good way to armor yourself with the presence of the Lord. Filling yourself with His promises by the way of the Word is a way to protect and affirm yourself, should any doubt or negativity present itself to you throughout the day. An easy way to get scripture in your system as soon as you start your day is to use a daily devotional. Daily devotionals give you the Scripture in doses, easy for consumption. and even easier to relate to and apply to your everyday life. 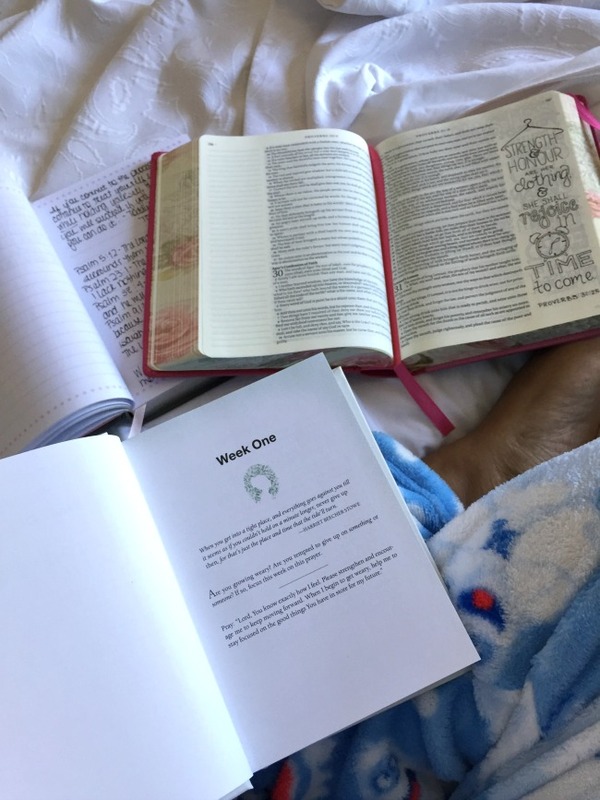 Here, I share three reasons to add a daily devotional to your morning routine. 1. They get your morning started on a positive note. Reading a devotional each morning can get your day started on a positive, inspiring note in minutes. A quick assuring word from the Lord may be just what you need to get your day started on a good note. Having a good devotional on hand gives you encouragement, provides you with instruction, and gives you clarity for whatever unseen challenges you may face. 2. The messages are quick and easy to digest. The daily passages in a devotional are usually short with a quick, poignant message. This aspect appeals to busy women who are looking to get a daily dose of scripture on the ready. The theme and scripture are already provided for you, so there's no need to think too long on what text you'd like to study when you open your Bible. And a nice companion to your Bible, a good devotional can guide you through reading scripture with a renewed sense of purpose and fulfillment daily. 3. The lessons can easily be applied to everyday life. Devotionals, depending on the type you choose to read, share how readers can apply God's Word to their daily lives. The best ones provide a way to put God's Word to work in small, actionable steps each day. Sometimes applying the lessons we learn from the Bible can be a lot to digest, but taking in small lessons, one at a time, helps us to better see the scripture working in our lives. Currently, I have two daily devotionals in my rotation for 2019. One is an updated version of last year's devotional, while the other uses a common practice that I love to use to affirm my days. The first devotional I have been enjoying is The Confident Woman Devotional: 365 Daily Inspirations by Joyce Meyer. This is an expanded and revised edition of my favorite devotional from last year. 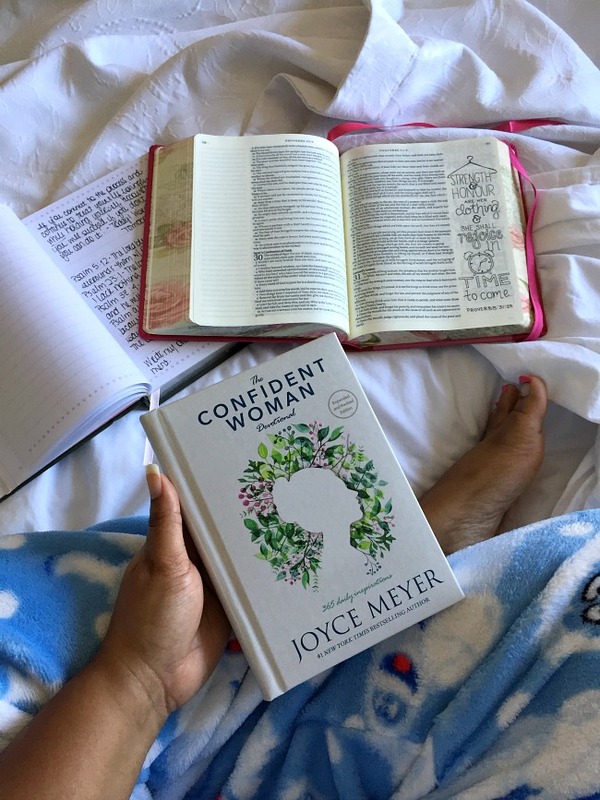 The Confident Woman Devotional by Joyce Meyer packs a powerful message in an easy-to-digest dose on the daily. Based on Joyce Meyer's book The Confident Woman, this devotional tackles issues women face that get in the way of us being our most confident selves. 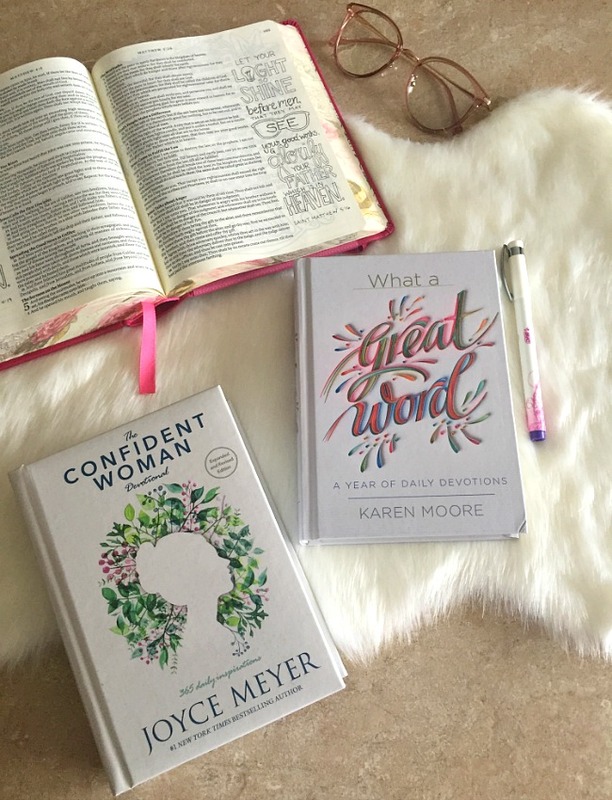 From worrying about the future to being held captive by choices we've made in the past, The Confident Woman Devotional has a gentle word of encouragement we all can relate to. The format has a theme for each day, leading with a bible verse centering around that theme. Following the scripture are anecdotes and personal insight from Joyce Meyer, with actionable suggestions to help readers grow deeper in Christ according to the daily theme. The devotional then concludes wraps up with a small theme-fitting prayer for the day. I love this format, as it allows readers to be presented with the scripture, read an example of the word at play in daily life, and read a prayer according to the scripture. To grab a copy of The Confident Woman Devotional by Joyce Meyer, visit Amazon, Barnes & Noble, and/or other places books are sold. 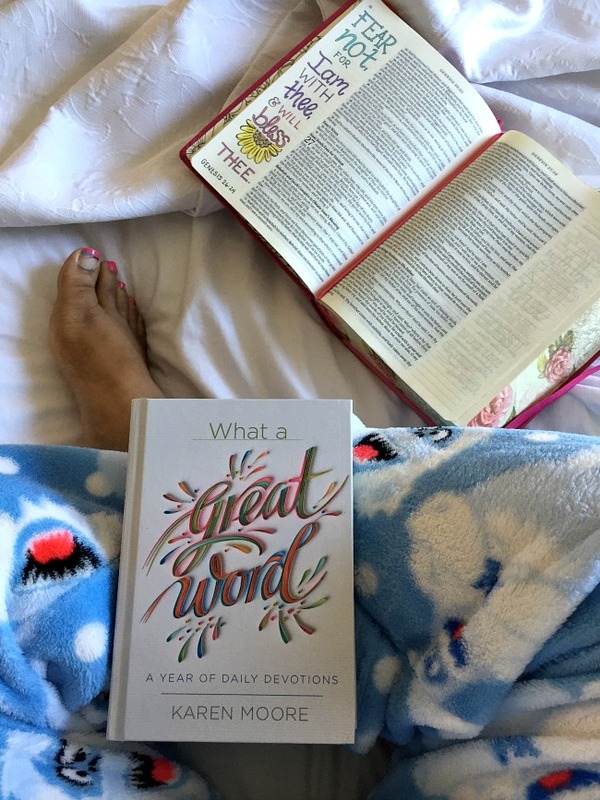 Another devotional I have been enjoying so far this month is What a Great Word: A Year of Daily Devotions by Karen Moore. What a Great Word by Karen Moore is a unique devotional in the way it uses a one-word theme to meditate on each day. As someone who has taken part in "one-word theme" yearly resolutions, I find using a daily word affirmation to be quite refreshing. Karen Moore uses words we use all the time to illustrate the promises found in God's Word. Similar to The Confident Women Devotional, What a Great Word is also formatted to offer scripture, insight/encouraging words, and a prayer that ties the theme together. I look forward to opening this devotional each morning to see what word I will speak over my day to unlock the true power of the scripture. And I think other readers will appreciate this as well! To grab a copy of What a Great Word by Karen Moore, visit Amazon, Barnes & Noble, and/or other places books are sold. As a lover of daily devotional books, each one I've owned has been a great resource in my spiritual journey. Devotionals equip me with a daily reminder to stay grounded in the Word of God by reading it, praying on it, and applying it to my life in small, yet impactful ways. Reading daily inspiration from the likes of Joyce Meyer and Karen Moore keeps me focused on my goals, inspires me to be my best self, and corrects me in my wrongdoing, all while reminding me to make time with God a priority in my life. My morning routine would not be complete without them! 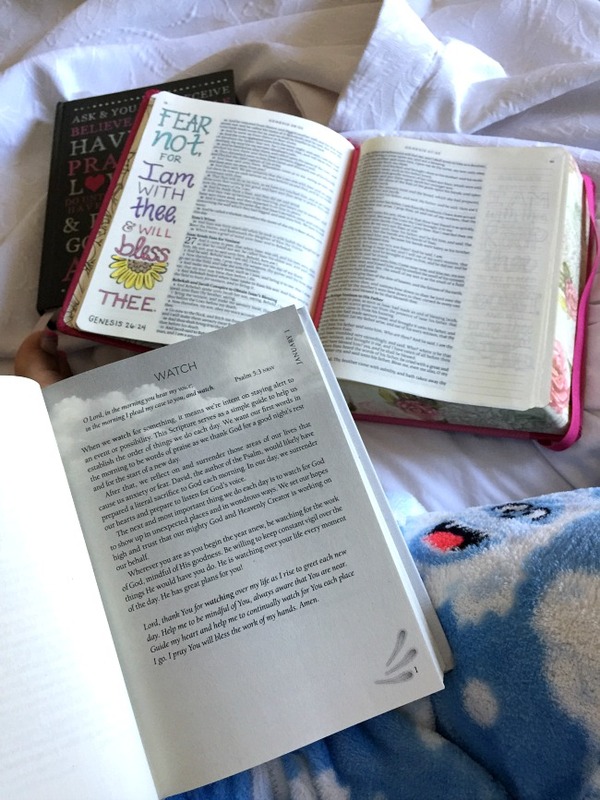 Are daily devotionals a part of your morning routine? Disclosure: These devotionals were sent to me by Faithwords/Hachette Book Group for review. However, all thoughts and opinions expressed are my own. To read more about my disclosure policy, click here.